We all have studied about the Mutiny Sepoy of 1857, The rebel of Jhansi Ki Rani and other incidences that shaped the agitation and reaction of people against the British Rule. But, the most important story from the History of India is missed by many Indians. No, I am not telling you it’s your mistake. The reason behind this big missing in our knowledge is customization of text-books according to the region we live. Well, to get back to the story, this is the story of Rani Velu Nachiyar, who is credited as one of the few leaders who fought Britishers and got their Kingdom back. The reason because her story is mentioned below and you will seriously adore her after reading the whole article! Rani Velu Nachiyar was the first ever woman from a royal family who challenged the mighty British Empire. Brave heart queen Velu Nachiyar revolted against English empire 85 years before Rani of Jhansi challenged Colonial power. Rani Velu Nachiyar was born in 1730 AD to the King Sellamuthu Sethupathy and to Rani Sakandhimuthal of Ramnad Kingdom. Since the royal couple had no male heir. So, considering her as their son she was trained in weapon skills and martial arts, horse riding and archery and was exposed to all types of war strategies. 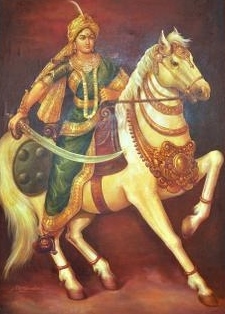 As she knew all the war techniques, Velu Nachiyar took to arms when her husband, Muthuvaduganathaperiya Udaiyathevar of Sivagangai and his second wife were killed by British soldiers and the son of the Nawab of Arcot. She with her daughter escaped the British attack, and sought refuge under the protection of Hyder Ali at Virupachi Near Dindigul for eight years. During the eight years of refuge she formed an army and with the alliance of Gopala Nayakar and Hyder Ali she planned the attack on Britishers. In 1780, Rani Velu Nachiyar attacked the Britishers to win her kingdom back. She won the battle and ruled in her territory for over there for 10 years. She is credited to use the first human bomb to win battle. When Velu Nachiyar found the place where britishers kept their ammunations. She ordered her faithful follower, Kuyili, to oil, light herself and walk into the store house. This destroyed the whole ammunation support of britishers. This was a tribute to Rani’s adopted children Udaiyaal, who died while detonating the British Arsenal. 9. Indian government gave tribute to Rani Vela Nachiyar, by releasing postage stamp of her name.